ASKER, NORWAY (26 May 2017) - TGS and Petroleum Geo-Services ("PGS") announce the fourth 3D seismic project offshore Eastern Canada for 2017. Long Range 3D will comprise approximately 9,100 km2 of 3D GeoStreamer® data in the Eastern Newfoundland region. The survey covers open acreage which will be included in the November 2018 licensing round under Newfoundland and Labrador's Scheduled Land Tenure system. Following completion of these surveys, the jointly-owned library will have more than 175,000 km of 2D GeoStreamer data and 28,500 km2 of 3D GeoStreamer data. An expansive well log library is also available in the region, along with advanced multi-client interpretation products that will improve play, trend and prospect delineation. "With four 3D projects now committed for 2017 this will be our most active year ever in Newfoundland and Labrador. E&P companies are continuing to prioritize this region in their exploration strategies and we are well placed to support them as they prepare for future licensing rounds," commented Kristian Johansen, CEO of TGS. 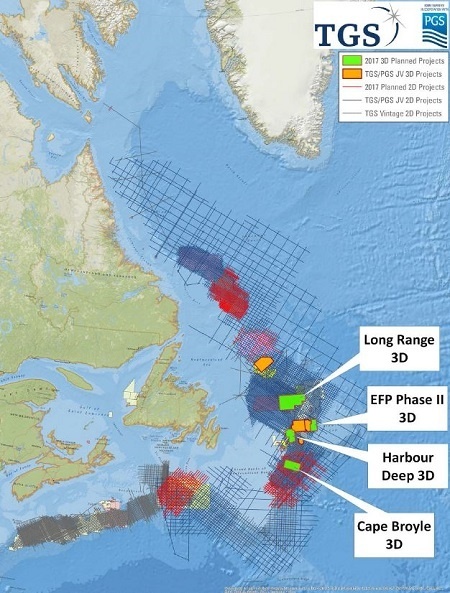 "Our increased data library coverage in the Newfoundland Labrador region will be of benefit for oil companies exploring this high potential area. We will operate three 3D vessels and one 2D vessel offshore East Canada this year, which is more than ever before and reflects high customer interest," says Jon Erik Reinhardsen, President & CEO of PGS.